Octopus, cuttlefish and squids (Cephalopods) are notorious for being tricky to cook.There are basically only two ways to cook them: very hot and short (under 1minute) or long simmer, braze or bake, around 1 hour. Yup, that is a big gap togo from 1 minute if you miss to one hour! I have never tried the long cookingmethod before until now. Am I ever glad that I did try it! The cuttlefishcame out so tender and buttery that I will use this long cooking method more often from now on. I have also readthat pressure cooker gives excellent results and shortens the time three-fold so I will have to try this method as well. 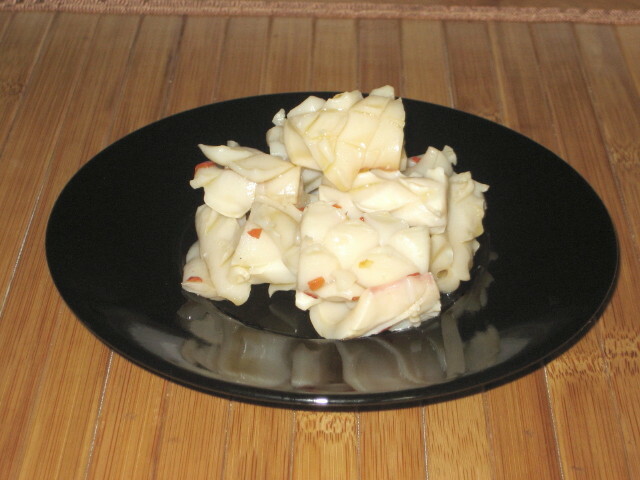 For this recipe I used cleaned large cuttlefish tubes thatI bought frozen in Asian supermarket. There were 2 tubes in a vacuum packed bag and were about 8”long and 3-1/2” wide with thick wall, absolutely ideal for my recipe. Open up thecuttlefish and score the inside ofthe flesh in a crisscross pattern, being careful not to cut right through, thencut the cuttlefish into diamond shaped pieces. If you cut at angle the pieces willbe very decorative, almost like a flower, once it is cooked. To prepare abraising liquid: for each cup of cuttlefish pieces mix 2 cups of water, 1cup of white vinegar and 1 Tbs. of Kosher salt. Place the squid in a pot largeenough to hold the squid and braising liquid, cover the pot and turn on mediumheat. When it comes to boil lower heat to simmer and continue cooking for about45 minutes. Strain thecuttlefish and wash under warm running water and then drain in colander. 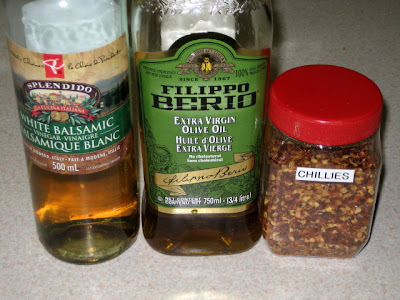 While thecuttlefish is cooking prepare your pickling marinade by combining 1/4 cup of whitebalsamic vinegar, 1/2 cup of olive oil and hot pepper flakes to taste for eachcup of cooked cuttlefish (theywill shrink by about 1/3). Place the squid in a jar leaving about 1/4 of emptyspace and pour marinade over the cuttlefish. Fill with white wine to 1/8” from top,close and refrigerate overnight. Serve at room temperature with crusty bread asan appetizer.